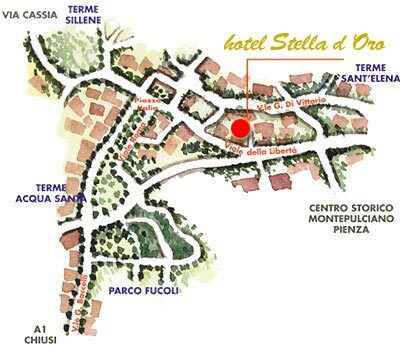 The hotel Stella d'Oro is located in Chianciano well-known thermal village between Tuscany and Umbria and half way between Rome and Florence. It represents the best starting point for discovering or rediscover the wonders of a territory which is still most "uncontaminated". Montepulciano 12, Chiusi 12, Monticchiello 14, Città della Pieve 22, Pienza 24, San Quirico d'Orcia 25, Lago Trasimeno 29, vetta Monte Amiata 39, Montalcino 40, Cortona 42, Abbazia Monte Oliveto Maggiore 49, Abbazia Sant'Antimo 49, Orvieto 55, Deruta 61, Perugia 62, Siena 70, Arezzo 72, Assisi 85, Firenze 132, Roma 167.